Without further ado(and because my browser crashed when I submitted this the first time...) I will be giving what I've identified from RM. Rei Ayanami is present in Eva-01 during the 1st interchangeability test. Rei's vision may be brought on by contact with the resident soul of Eva-01, Yui Ikari. At the end of the vision Rei looks up from within Eva-01 and is patently shocked, letting out a gasp. Mountain... Heavy mountains. Things that change over time. Mountains are an object not heavily expressed through the Rebuild series but when the Impact initiates at the end of the 2nd movie, there were clear visuals of a mountain shattering. When Q starts, we learn that there are big changes to earth, going with Rei's line that mountains are heavy things that change over time. In the preview of Q as well, Gendo is seen atop a mountain. Sky... Blue sky. What your eyes can't see. What your eyes can see. Flowers... So many of the same... And so many unneeded. Flowers represent life, which Rei obviously does not cooperate with, bringing death into the picture. In Q, there were cuts of flowers growing between the tiles at Neo-NERV. They were growing in the red sand. The Impact that initiated the process that changed the planet and created a lot of redness and core material involved rescuing Rei and likely involved her altogether. The flower, which is the same as so many others, was grown on the red dirt that Rei changed. Rei is a clone too, in the same way that she looks at the flower. Q actually solidifies this feeling when Shinji is looking around Neo-NERV HQ and sees thousands of abandoned Evangelion units, tanks, etc. "So many of the same, so many unneeded"
Sky... Red, red sky. The colour red. I hate the colour red. Aside from the sunsets in NGE, this can reference the red clouds in the sky, which reflect the red sand below, in Q. The clouds are an important image for Final. Blood... The smell of blood. A woman who never bleeds. Man made from red soil. Man made from man and woman. If Rei is Lilith, man is made from her soil. Red soil can represent dried out soil(infertile) or Lilith-bloodied soil(man was made from soil, and man came from Lilith). The artificial evolution rite performed between 2 and Q appeared to involved not only organisms but buildings and objects too. Thus the soil was made red and core-like. But because the rite was imperfect, hinted at through red soil and an unhealthy woman, FOIs were produced. In EOE, when Third Impact begins and the Black Moon is revealed, SEELE announces a red earth purification ceremony as well. NGE used a lot of city scenes but none were very exciting. They were fillers. But in Q, Gendo states that SEELE saved humanity from the burden of death by giving us civilization. Rei too makes a similar mention by stating that cities are a human creation. Rei then proceeds to state that which we literally know of her in Q: that she's a vessel for a soul. Then there's the deconstruction of her identity. I think the red sand is an important image for Q and Final, what does everyone else think? I'm not sure my thoughts are together enough to comment on anything yet really, but there's also the fact that in EOE, SEELE says something along the lines of "let the Red Earth purification ceremony begin". I would say blue skies are very important to the Rebuild series. The red/blue color scheme is used a lot, red being used to represent death or lifelessness (red oceans, red earth), while blue represents something else, maybe life or hope (seen with the blue water at the restoration facility in 2.22). The blue skies in Q are heavily contrasted with the red earth. One of the most beautiful shots of the film is when the awakened Unit-13 ascends to the blue skies, just before shrouding it with red from the Gates of Guf. Then there are the two posters provided by the OP. 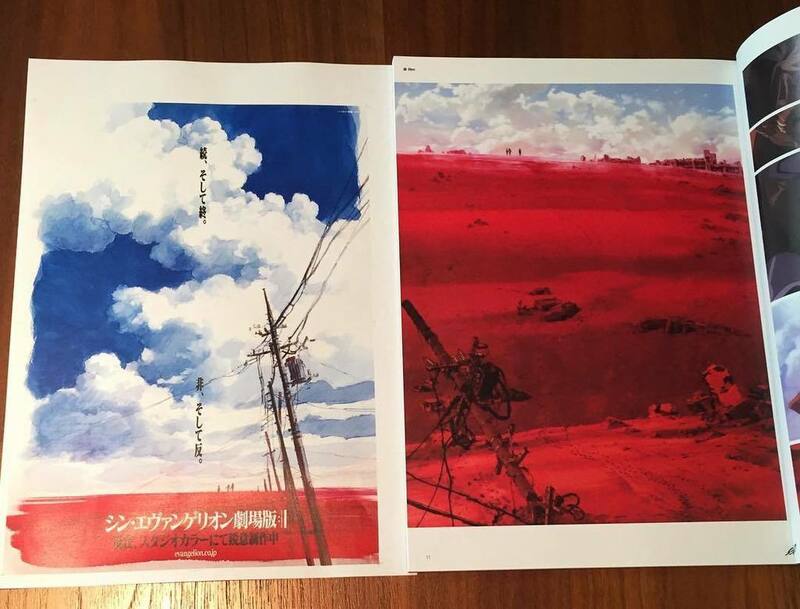 The first of the posters focuses on the lifeless red earth, while the newer poster focuses more on the blue skies, on hope. There's another red/blue opposition : Blue is the color of WILLE, as seen by the armband most of its members wears as well as the blue logo on Misato's cap and Sakura's beret, while neo-NERV's logo is still red. ^Now that's one I've never even noticed, though it seems so obvious in retrospect. Red versus Blue. Good catch. Team red vs team blue just got a whole new meaning! There are some masterful cuts in that movie. If we're to get into every little instance of red/blue, there's a lot. I focused on the blue skies because it was mentioned in the OP, and particularly related to Rei's NGE monologue. I know it's fun, but let's try to stay focused on the topic. Both of the uses brought up are entirely relevant and help bring context to the color symbolism. More than topical enough. Since OP references NGE: EoE uses red to represent death and the spirit world, while blue is used to represent life and the physical world. Could also be seen as fantasy vs. reality. Unclear to me if the red vs. blue moments in the TV series are going for something similar. One thing I've wondered is, given the importance of turning the lifeless red oceans to blue and full of life in 2.0. That it could be a reference or perhaps taken inspiration from red tide events in reality? Since those are most often associated with mass die offs in the areas that it happens.